Between July 16th and 19th, 1812, Constitution made her great escape from a squadron of five British warships in the opening days of the War of 1812. The “legend” of USS Constitution had begun. Old Ironsides” made 20th century history on July 21, 1997, when she sailed, in honor of the 200th anniversary of her launch, for the first time in 116 years. And, just one year ago, on July 23rd, America’s Ship of State returned to the waters of Boston Harbor when she was re-floated from Dry Dock 1. So we take this notable month in “Old Ironsides'” long history to bring to a close the unfolding story of Constitution‘s 2015 – 2017/18 restoration. If you have been a faithful reader of this blog, you will have followed the ship’s entry into the Charlestown Navy Yard’s historic Dry Dock 1 on May 18, 2015, the different restoration projects including the cutwater, waterways, hull planking, quarter galleries, and copper sheathing, and the re-float on July 23, 2017. “Old Ironsides'” first 21st century dry docking was a success. Now, we will finish the restoration with the stories of the last big projects that make Constitution once again look like the War of 1812 icon that she is. You will notice in the photograph of Constitution below, taken in mid-June, the ship is currently rigged with four yards on each of the three masts. On the fore and main masts, the yards are (bottom to top): fore/main course or yard, fore/main top yard, fore/main topgallant yard, and fore/main royal yard. On the mizzen (aftermost) mast, the yards have slightly different names and uses than on the fore and main masts. On the mizzen, the spars are (bottom to top): cross-jack yard (commonly pronounced “crojack” and neither “mizzen” nor “yard” are used as denominators as there is no other crojack on the vessel), mizzen top yard, mizzen topgallant yard, and mizzen royal yard. On the bowsprit (the multi-sectioned spar that is set at an angle from the bow), the spritsail yard is suspended. Of the thirteen yards on Constitution, neither the spritsail yard nor the crojack ever carried sails in the ship’s career. By the late 18th century, when Constitution and the other five original frigates were built, rigged, and launched, a sail on the sprit yard was rendered obsolete by the multiple triangular staysails/jibs that could be set from the bowsprit stays. For “Old Ironsides”, the spritsail yard carries rigging for the jibboom and flying jibboom. Constitution‘s crojack was the first yard installed on the ship as her up-rigging got underway in April 2018. Like the spritsail yard, it didn’t and doesn’t carry sail – instead, this horizontal spar is used as a spreader to which the foot (bottom) of the mizzen top sail is sheeted home and to carry running rigging from the main mast. New and different synthetic rope/line has been introduced to “Old Ironsides'” rigging in the 2015 restoration. 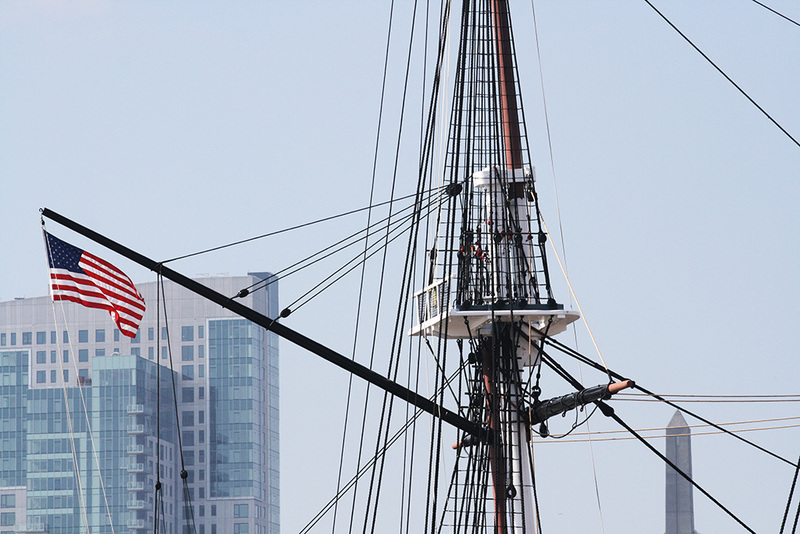 For rigging the yards, the Detachment Boston riggers switched from steel cable and polyester to Dyneema® for slings. The extra strength of the high performance Polyethylene line and lighter weight are great advantages for the miles of rigging needed on “Old Ironsides”. As part of Constitution‘s 2015 restoration, most of the standing rigging was removed for inspection, overhaul, and replacement. Several of the yard slings and lifts (supports) which were either steel cable or Polyester were replaced with Dyneema®. Along with replacing the line, metal “thimbles” which help to hold the hardware of the rigging needed to be completely replaced. The pressure of the rigging was so great on some of the thimbles that they were mis-shaped and needed to be completely replaced. USS Constitution‘s running rigging has been a fibrillated polypropylene since the 1992 restoration. For the 2015 restoration up-rigging, P.O.S.H., a spun polyester, was being introduced for the braces for the yards. P.O.S.H. resembles real fibre line and has a great “hand”, or feel, of natural hemp rigging. As has been discussed in previous restoration blog posts, work to maintain and preserve USS Constitution never actually stops. But, the larger tasks of 2015 restoration have been completed and “Old Ironsides” is back at Pier One, ready for another summer of welcoming visitors from all over the world. We hope you will have the opportunity to come to Boston and tour America’s Ship of State – soon!